Getting rid of invasive garlic mustard! 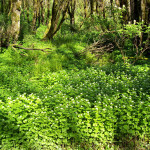 Garlic mustard is a very invasive, fast-spreading weed, and Multnomah County has the worst infestation of it in Oregon. The roots produce a chemical that is toxic to other plants, and it can grow in most soil types. It can also grow in full sun or full shade, making it a threat to a wide variety of our native plants and habitats. You can help get rid of it, though – read on for some important tips about pulling up and getting rid of garlic mustard. Many other plants are often mistaken for garlic mustard, especially before the flowers come up. Control is easiest when garlic mustard plants are in bloom (usually beginning in April), unless you can easily identify the rosettes (leaves) of the plant. Hand removal can be a successful technique in small patches that can be visited often and re-pulled frequently. Learn how to pull up garlic mustard and see more photos after the break! Many other plants look similar to garlic mustard in the “rosette” (leaf) stage before flowering, making it difficult to identify! It’s best initially to pull during flowering, before the plants produce seed. Pull at the base of the plant and try to remove the entire root. 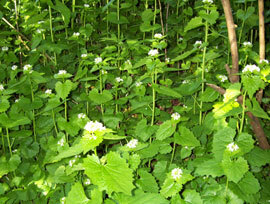 Pulled garlic mustard material will still complete flowering and set seed – do not leave it on the ground! Be sure to bag and dispose of pulled plants as garbage. 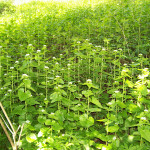 Mowing garlic mustard is not an effective control because plants will still bolt (send up flowers) and seed. To prevent spreading, do not mow garlic mustard when seed pods are present (May-September). Revisit pulled sites as often as possible to re-pull plants that sprout from left behind root fragments. This is especially important later in the spring as seeds develop. Larger infestations of garlic mustard may require other approaches. Check out our Garlic mustard page for more information on garlic mustard and control methods – certain residents in our District (our District is all of Multnomah County east of the Willamette River) may be eligible for free control! 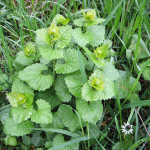 EMSWCD » News » Getting rid of invasive garlic mustard!